How Much Weight Can a Plastic Pallet Hold? Few things are as dangerous or disruptive as a pallet breaking under a heavy load. The GMA spec wood block pallets that most grocery and produce packaged goods are shipped on are only rated for an evenly distributed 2,800-pound load. While a shipment of 16-ounce bottled water weighs in at about 2,000 pounds—under the load limit—when in motion, however, the dynamic load can easily exceed the weight limit. The result: a broken wood pallet and flustered workers trying to manually move the product onto a new pallet. Weighty fluids like cleaners are also a strain on wood pallets—and threaten the liability of a hazardous spill. Wood pallets are not the ideal platform for shipping heavy loads like bottled water, canned food, and household cleaners. Operations managers and shipping coordinators understand how much money is wasted by wood pallets causing damage to product, injury to personnel, maintenance to machinery, and excessive wood debris. In the search for an alternative, they may find themselves asking: How much weight can a plastic pallet hold? The answer is that the iGPS plastic pallet holds more than enough weight to safely, efficiently, and cost-effectively get your products to market. How Much Weight Can an iGPS Plastic Pallet Hold? It may surprise you just how much weight a plastic pallet can hold. Plastic pallets are stronger than wood, sometimes vastly stronger. For instance, an iGPS plastic pallet can hold 2,800 pounds edge-rackable. An iGPS plastic pallet is also capable of supporting an evenly distributed static load of 30,000 pounds at rest and a 5,000 pound evenly distributed dynamic load when in motion. This dynamic load capacity is a great advantage as it helps food, beverage, and pharmaceutical manufacturers avoid broken wood pallets when moving loads within the warehouse or anywhere throughout the supply chain, eliminating costly delays. 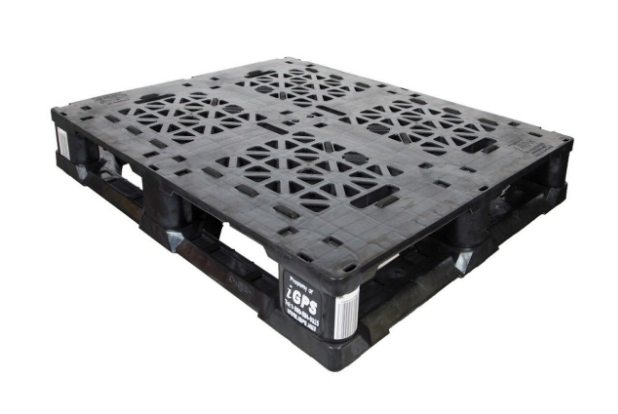 While the robust dynamic load capacity of an iGPS plastic pallet is unmatched, perhaps its real strength is not only in its capacity to transport heavy loads, but to do so on a lightweight platform with uniform density, shape, and size. The last 30 years have seen a revolution in how supply chains are managed, with seemingly on-demand manufacturing and just-in-time delivery removing inefficiencies in the supply network and exponentially increasing the volumes moved. This revolution was made possible by evolving computer power and networking as well as the adaptation of Automated Storage and Retrieval Systems (ASRS) that allow warehouses to store greater volumes of products in less space and move those goods more quickly. Wood pallets, however, are virtually incompatible with automated technologies. The natural materials that wood pallets are built with, as well as the way in which they are joined together and their limiting weight restrictions, can cause time-consuming jams or expensive damage to an ASRS. While a great investment that pays for itself over time by speeding the fulfillment of orders, an ASRS must be paired with a platform that works smoothly alongside the system. The consequences of a work stoppage caused by a wood pallet are enormously costly and disruptive for a warehouse. Uneven density: Wood is a natural material. As such, it has vast variations in grain and density. This is an appealing feature in a cabinet but is a potentially endless source of problems in a precisely programmed ASRS. Slight differences between wood pallets can throw off automated movements, increase the magnitude of force from some angles, and unbalance otherwise evenly distributed loads. Loose nails and wood shards: Nails are a hazard not only to unsuspecting feet or hands but also to machinery. A loose nail can work its way into gears and bearings, potentially bringing the machinery in an ASRS to a halt and necessitating expensive repairs, or even a full system replacement with a multi-million dollar price tag. Wood pallets also create wood debris, sometimes in the form of large pieces of wood, that can break off and jam or damage ASRS equipment like conveyor rollers. Chemical contamination: Hygiene is a constant concern with wood pallets. The natural grains of wood absorb fluids, including toxic chemicals. And, as mentioned above, when the weight threshold of a wood pallet is not up to the task of transporting heavy chemically-based cleaners—resulting in a pallet break and subsequent spill—a widespread inventory contamination by volatile chemicals is a very real possibility. An iGPS plastic pallet resolves these issues associated with wood pallets. Weighing approximately 50 pounds evenly distributed throughout the pallet, iGPS plastic pallets are a uniform size and shape that works seamlessly with ASRS programming. They also eliminate the threat of extensive and costly damage caused by wood pallets that simply cannot hold their weight in the era of automation. The iGPS plastic pallet can support the full weight of a 2,800 pound edge-rackable load and the additional forces that come from that same dynamic load being put into motion. This prevents the inefficient scramble to manually move loads from a damaged pallet to an undamaged one. In today’s world of fast shipping expectations, the expense of such delays are ever growing. By preventing avoidable delays and product damage, as well as by increasing worker safety, the iGPS plastic pallet reduces the Total Cost of Business (TCOB) with a robust pallet and pooling system that is far stronger than its wood competitors and is recognized for its safety and sanitation. Grocery manufacturers rightly demand a pallet with high performance throughout the entire supply chain, whether it’s being handled by a forklift, pallet jack, or an automated system such as ASRS. And, only the iGPS intelligent pallet pooling system combines a strong, safe, and lightweight pallet with the convenience of a pallet pool that reaches across North America, ensuring a supply of clean, food-grade plastic pallets, wherever and whenever they are needed to keep modern supply chains in motion. To lower your Total Cost of Business by reducing labor costs, delays, and maintenance with the iGPS pallet, while offering your retail partners and consumers safe, hygienic on-time delivery, give our team a call at 1-800-884-0225, email a specialist at switch@igps.net, or visit our contact page.